Ah Monmouth. How I love thee. I have, in fact, already written a missive of love about thee. This was a tough roast - seriously dark, full bodied, and with next to no acidity. Rich and uncompromising, it's a bit like that 97% cocoa chocolate you can buy - it's seriously impressive but one wonders if it actually needs to be quite that punchy. What acidity existed was a fruity acidity, rather than being citrusy. Jono liked it, describing it as having "latino notes evoking tempestuous women and the vigour of a matador" (he got the wrong Central American country; matadors are more prevalent in Mexico rather than Guate) and gave it 8 out of 10, before downgrading it to 7 for the crime of having a disappointingly short after taste (I disagree). But again, we saw a slight divide between the full bodied brigade and the zingy acidity club. Emily's review contained less guff than Jono's and was generally more descriptive: "sour cherries and burnt toast with a slightly smoky aftertaste. It's bold, but I'm not so sure it's beautiful." 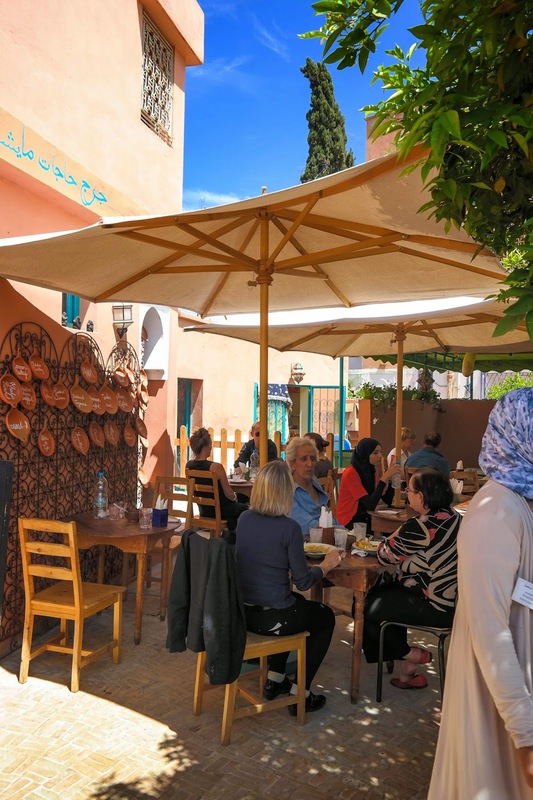 Association Amal – or the Amal Women's Training Centre and Moroccan Restaurant, to give it its full name – is not situated in a part of town that offers the average Marrakesh tourist much in the way of diversion. I know this largely because, as we climbed into the taxi having bartered hard for a fare halfway approaching reasonable, the driver demanded to know what we wanted with the locale we had given as our desired destination. "There is nothing for you there!" 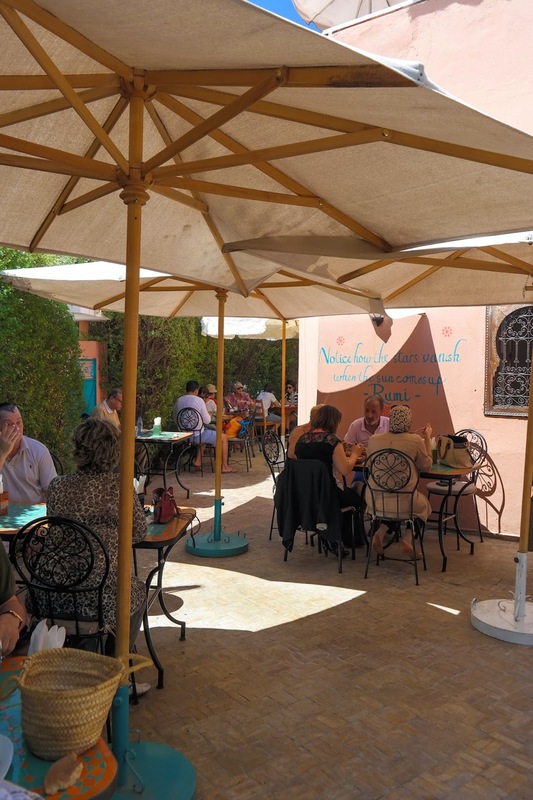 he cried out, before offering to take us to a much, much better restaurant, one of this finest in Marrakech, which – just by mere coincidence, mind – happened to be run by his brother in law. There then followed the age-old trick of "oh, it's closed today, it's holy day". Sure, it was a Friday, but no, it wasn't closed. Not nearly as much as one might expect is closed in Marrakech on Friday. But we stuck to our guns firmly, and I'm all the happier for it. Amal is set in a beautiful courtyard, shaded by orange trees that filter through dappled light. It's a wonderful setting, outside the Medina so all the quieter and in what is really a very nice part of town – we both commented on how it reminded us of the quieter neighbourhoods of Barcelona, or perhaps the richer parts of Buenos Aries. 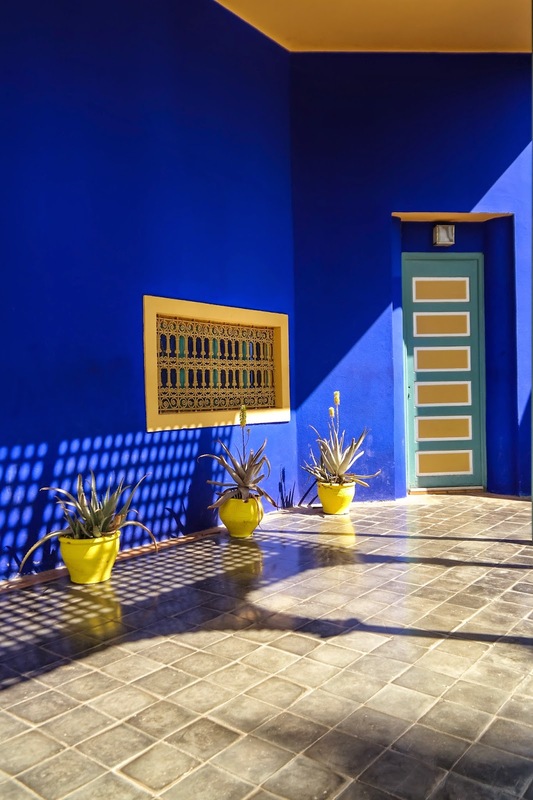 It's the smart quarter of Marrakech, and you feel that. So we grabbed a seat in the courtyard – luckily, it was 12.30pm and so quiet – had we come a mere half hour later without a reservation we would have been, respectfully and regretfully, turned away. This joint is popular for one very good reason: it's good. The fare served is basic, described by one guide as 'country cooking', and revolves around choice of daily cous cous, poulet frites (I expect the French influence has a lot to answer for here) and one daily special. For drinks, there's a seasonal special juice (strawberry on our visit – and I do believe they were in season, given the numbers of hand carts I had seen throughout the Medina groaning under the weight of a million strawberries), buttermilk (yes, actually, no idea why) mint tea and soft drinks. 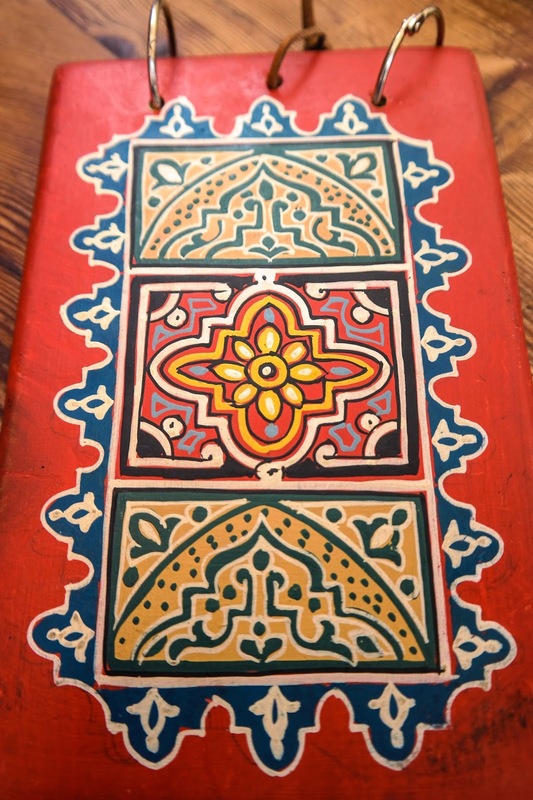 It's a limited, albeit daily-changing, menu that comes presented in one of the most beautiful menu card holders I have ever seen. 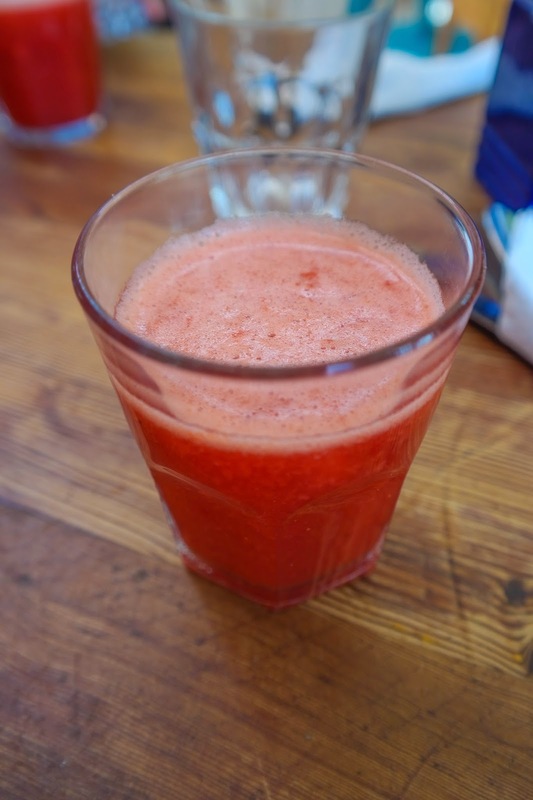 We ordered two strawberry juices, which were ace. Really nothing more than pulped strawberries, in a country that so often boils or steams fresh produce, or else only offers oranges, it was a welcome treat. Then there came the cous cous. 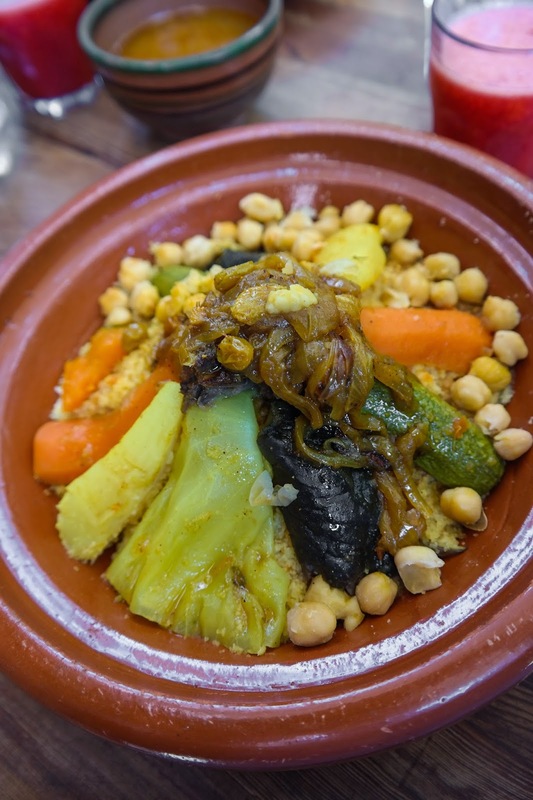 Again, we both ordered the daily special cous cous, which came with steamed vegetables, caramelised onions and sultanas. 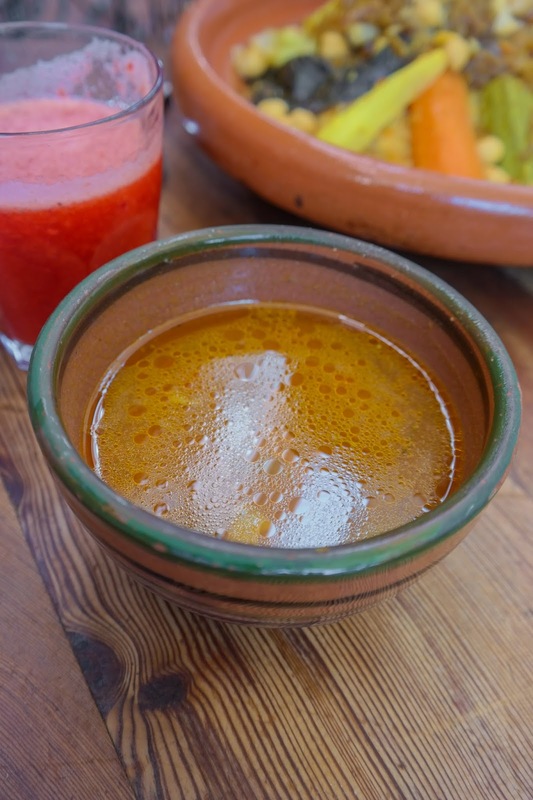 It also comes with a vegetable stock-based soup, which you are supposed to ladle over your dish to add some wet. It was good. Basic, yes, but good. Hearty, filling, somehow appealing even in the mid-30s temperature. 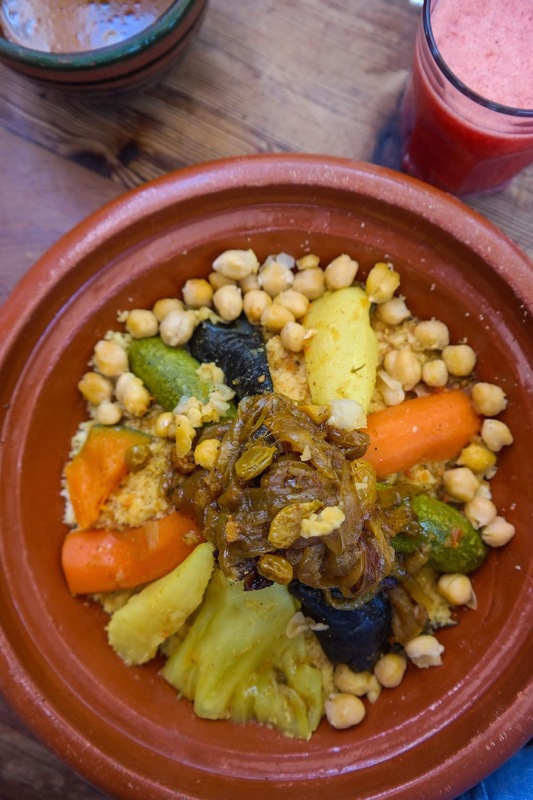 The vegetables avoided being mushy, like so many other offerings we were 'treated' to in Morocco. The caramelized onions and sultanas added a hint of interest and sweetness. And do you know what else? The whole meal cost less than a tenner. For both of us. And that's harder to get done, satisfactorily, than you might think in Marrakech (other than perhaps, if you eat at the stalls in the Jemaa El Fna). It's also a great project to support. You see, Amal (which, Oxfam tells me, means 'hope' in Arabic) is part of a non-profit culinary training centre for underprivileged women – including those struggling with literacy and poverty. The Centre's goal is to give those women the life skills they need to support themselves and their families. They have just had their second birthday and I wish them all the very best with this fantastic project for years to come. One last thing: there is stuff to do round there, whatever your taxi driver with an ulterior motive might tell you. 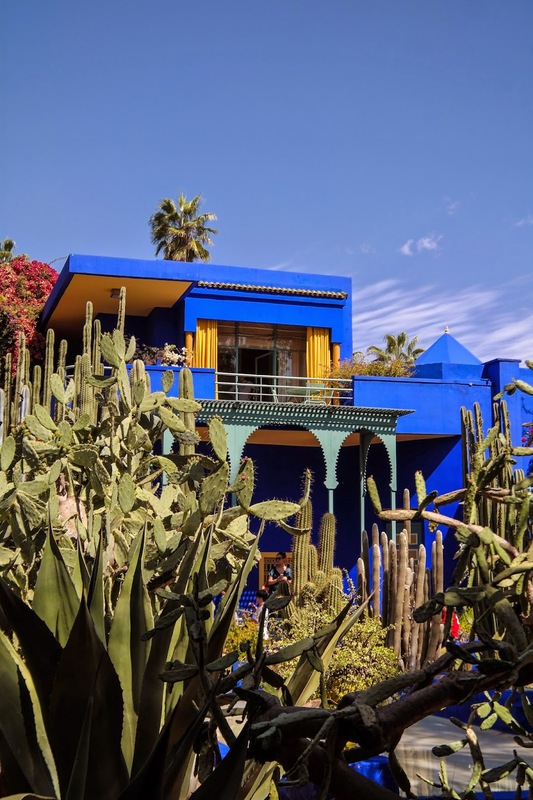 Amal is only a few minutes walk (if you can work out the local maps – easier said than done, I admit) from the Jardin Majorelle, perhaps better known as the Yves Saint Laurent gardens. They are beautiful and well worth an early morning – or perhaps a post lunch – stroll.